If your iPhone isn’t working properly, you can try resetting your iPhone settings, which resets every iPhone setting to its default — the way it was when you took it out of the box. Resetting the iPhone’s settings doesn’t erase any of your data or media. The only downside is that you may have to go back and change some settings afterward. Tap the Settings icon on your Home screen; then tap General→Reset→Reset All Settings. Be careful not to tap Erase All Content and Settings — at least, not yet. Erasing all content takes more time to recover from (because your next sync takes a long time), so try Reset All Settings first. 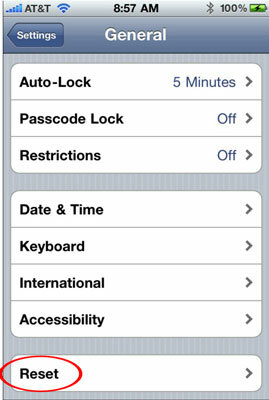 Reset some of the other options available on the Reset screen, such as Reset Network Settings, Reset Keyboard Dictionary, Reset Home Screen Layout, and Reset Location Warnings. It’s not likely to help, but might be worth a try before you resort to erasing all content and settings. If resetting all settings didn’t cure your iPhone, tap Settings→General→Reset→Erase All Content and Settings. This strategy deletes everything from your iPhone — all your data, media, and settings. Because all these items are stored on your computer — at least, in theory — you should be able to put things back the way they were during your next sync. But you lose any photos you’ve taken, as well as contacts, calendar events, and any playlists you’ve created or modified since your last sync. After using Erase All Content and Settings, check to see whether your iPhone works properly. Hopefully, your iPhone is back to its old self.